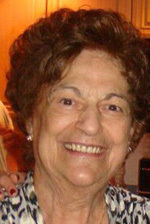 Gloria Salvatore (nee Leggieri) of Philadelphia died Friday, Oct. 24. She was the wife of the late Hon. Frank A. “Hank” Salvatore. She is survived by her children Elizabeth Chiolan (Joseph), Gloria Jean Ammlung (Wayne), Frank C. (Cindy), John (Marianne) and Anthony (Lorrie), and by 18 grandchildren and 4 great-grandchildren. A viewing will be held Wednesday, Oct. 29 from 9:15 to 10:30 a.m. at St. Christopher Church, 13301 Proctor Road in the Somerton section of Northeast Philadelphia. The funeral Mass will follow at 10:30 a.m. Interment will be at Resurrection Cemetery. In lieu of flowers, the family prefers contributions to the Alzheimer’s Association, 399 Market Street, Suite 102, Philadelphia, PA 19106.